Maine Gov. 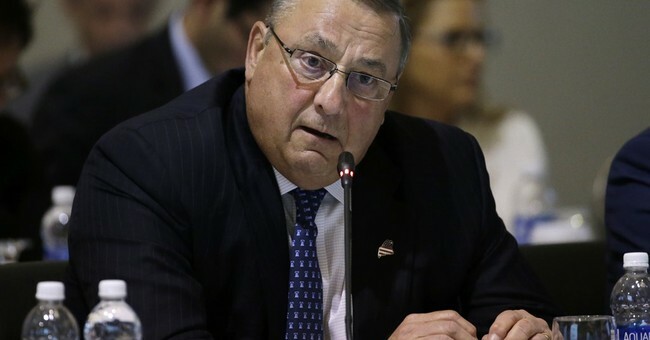 Paul LePage (R) signed a very unusual piece of legislation on Thursday: he pardoned a dog. LePage pardoned Dakota, a Husky who had been ordered to be euthanized after breaking a confinement order her owners were unaware of. According to the Waterville Area Humane Society, where the dog currently lives, Dakota is not an aggressive or vicious dog and she had been a "model animal" under their care. Dakota's previous owner had been abusive. Part of the facts included a mix up with Dakota’s new owners. In February of 2016, Dakota escaped from her home and attacked and killed a smaller dog. As a result, the husky was ordered to be confined to her home, unless she was leashed and muzzled. Following this incident, Dakota was dropped off at a local shelter as a stray and was adopted by a new owner, who was unaware of the dog’s standing confinement order. Shortly after her adoption, Dakota was found running loose. While she didn’t cause any damage, her escape from her new home was seen as a violation of her confinement order. In response, the court brought the dog in, leaving her under the care of the Waterville Area Humane Society, and ordered that she be euthanized for the infraction. Despite the signed pardon, it is still unclear if Maine law actually permits the pardoning of animals. LePage is a dog owner himself, to a Jack Russell terrier mix named "Veto." Veto was adopted in 2016 after his previous dog Baxter passed away from cancer.